Additional aluminum profiles include different aluminum shapes such as trim caps, rods, angles, bars and channels, which provides a small sample of the wide range of configurations and sizes that aluminum profiles are available in. Aluminum extruded profiles can be hot extruded, cold extruded or warm extruded through a die and each of these extrusion processes have their own benefits and drawbacks. Aluminum profiles are highly versatile and can be custom-designed for applications such as fitness machines, wall siding, structural applications, car bumpers, window frames, electronic components, hardware joints and light building frames. Serving industries including construction, medical, office furniture, industrial manufacturing and transportation, aluminum profiles are lightweight while maintaining a high strength-to-weight ratio. Some of the more common alloys that are used in the fabrication of aluminum profiles include 6061 aluminum, 6063 aluminum and aluminum 1100. 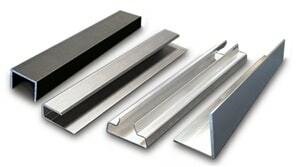 Aluminum profiles can be made using two different types of extrusion process: indirect extrusion and direct extrusion. Direct extrusion holds the die stationary while the ram forces the aluminum alloy through the die opening, while indirect extrusion holds the die stationary as the hollow ram moves into the stationary billet from one end, forcing the metal to flow through the die. In addition, extrusion processes include hot extrusion, cold extrusion and warm extrusion. In cold extruding, aluminum billet is pressed through the die at room temperature or near room temperature. Warm extruding, or forging, is done on billets brought to temperature ranges between 800 and 1800 degrees F. Hot extrusions are performed on aluminum which has been fully plasticized by heat and is often performed in a vacuum to avoid oxidation. After an aluminum profile has been extruded, it is straightened by a stretcher. Aluminum Profiles Aluminum profiles are extruded stock shapes of aluminum. These profiles are the shapes that the extruded aluminum products take the form of; for instance, a t-shaped aluminum profile is used in order to fabricate an extruded aluminum beam or extruded aluminum trim.